11 am to 10 pm (Wednesday to Monday). 11 am to 11 pm (Thursdays). Exhibition area close at 9 pm. Visit after 7 pm to enjoy the city by night. We are comparing Centre Pompidou Fast-track Tickets Prices from leading ticket suppliers and Try to find you Cheap tickets prices on the market. Like the Eiffel Tower, the Centre Pompidou was first rejected and heavily criticised by the Parisians who wanted smooth edges and beauty instead of the robust ‘inside-out’ façade that this building displays. Fortunately the Centre Pompidou managed to win over the hearts of resident and international locals and is now one of the most popular art galleys in Paris. Inside the centre you can find revolutionary examples of Surrealism, Expressionism, Fauvism, Cubism, and Dadaism, all dating from the 1960’s to the present day. Even those with limited interest in art will probably recognise the names of some of the contemporary artists displayed inside the Centre Pompidou. Take a look at masterpieces by world-famous Andy Warhol and well as brilliant modern artists such as David Flavin, Richard Hamilton, and Louise Bourgeois. Inside the centre you can also visit the public library, and with all that extra time you save with your skip the line ticket, you’ll able to browse the vast rows of books and take a seat with your favourite. If modern art and contemporary design draw your attention then this museum is sure to be of interest to you. The Centre Pompidou host one of the best collections of modern art. This ticket is ideal for people who have limited time to visit the city of Paris, it will save you time by skipping the entrance line. Great for photographers and people who enjoy city views. People of all ages can visit the museums and the venue is suitable for wheelchair users. Your Experience With Centre Pompidou Fast-track Tickets? Get guaranteed fast-track entrance to one of the greatest collections of modern and contemporary art in Europe. See the building that critics have named one of the ‘most radical high-profile architectural achievements’ of the 20century. After skipping the line make use of the extra time you will have to browse the exhibitions of innovative art. Contemplate the works of some of the most revered artists of the 20century including Maz Ernst, Francis Bacon, Picasso, Matisse, Man Ray and Kandinsky. 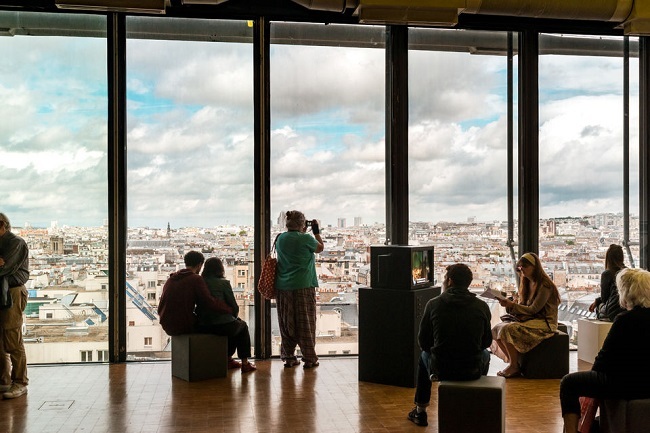 Pay a visit to the top floor to enjoy views over the city centre; you’ll be able to see The Towers of Notre Dame, The Eiffel Tower, the Sacre-Coeur Basilica and more. What Centre Pompidou Fast-track Tickets Includes? Fast-track skip the line entrance. Try to plan your visit for the early evening, that way you will be able to watch the sunset and enjoy the city by night but still have time to see the exhibition areas before they close. Travelers Reviews about Centre Pompidou Fast-track Tickets? Travellers have said that this is a ‘wonderful museum’ and that visiting was a ‘terrific experience’. They have also described the art as ‘modern and contemporary’, ‘moving’, and ‘strange and unsettling’. The Centre itself is highly rated on TripAdvisor with an average 4 out of 5-star rating from over 5,000 traveller reviews. On Tiqets website the attraction also had a fantastic 4.5 out of 5-star average rating (it is listed as a bestseller on their website). Reviews generally agree that priority access tickets were very convenient and easy to use. The Centre Pompidou is wheelchair accessible. Wheelchairs are available at the cloakroom Level 0 and also on Levels 5 and 6. Wheelchairs are free to use but you will need to leave a valid ID. Tickets can be printed or brought in electronic form. You will need to show your ticket at the entrance to the centre and possibly again at the observation deck. Tickets from certain tour providers are non-refundable. If your plans change, Viator will allow cancellations to be made for full refunds up to 7 days in advance and partial refunds up to 2 days in advance. The centre is free on the first Sunday of every month. Visitors under the age of 18 can enter free of charge. There may be a short wait at the entrance for security checks. To avoid additional delays do not bring large bags or any sharp objects. Your skip the line ticket is valid for a specified time and date, if you arrive late then you may not be permitted to enter and will not be refunded. Multilingual audio guides are available at the entrance (they are not included in the ticket price). Meeting Point: Place Georges-Pompidou, 75004, Paris. Metro: the closest stops are Rambuteau (Lines 1 or 11), Hotel de Ville (Lines 1, 4, 7, 11, or 14). Bus: lines 29, 38, 47, or 75 to Centre Pompidou. Duration: Both tours (bike and river cruise) last around 4 hours. Duration: Flexible, around an hour should be enough. Duration: The duration of the classic dinner cruise is 1:15 hours.Upgraded dinner cruise (Etoile, Privilege, Premier and Decouverte) is 2:30 hours. Duration: The tour of the Tour Eiffel lasts 1:30 hours & Seine cruise is 1 hour. Duration: Flexible, up to an entire day. Duration: The tour of the Notre Dame Cathedral lasts about an hour. Duration: The duration of the Best of Paris Bike Tour is between 3 and 4 hours.